The Spiritual Globe of Robert Rauschenberg is a white ~2:3 white cloth with a world map on it, shaped as two card-suit hearts with tips touching, the outline of which is horizontally symmetrical. The map shows blue seas and countries in the usual five colors (pink, light green, orange, yellow and light purple) but the projection does not fit the two heart shapes, which were cut out from a regular map (in Mercator, it seems) and thus parts of the world are missing. The UNESCO site used to say about this one that this design "underlines the spiritual dimension of tolerance" and quotes the author stating that "the globe opens out and becomes a heart resembling the hands Michaelangelo painted on the ceiling of the Cistine Chapel, which unite the creator to his creature". He also says that "this heart asserts itself as a spiritual organ setting the tempo of life on earth". Robert Rauschenberg was born in 1925 in the United States and is a leader of contemporary American art, still according to the UNESCO site. Detail [at the photobank website] enables to notice that this is an actual "collage", i.e. a pasting, (one can see the ridges of poorly applied glue) of an actual map. The second flag is The Breath of Fraternity by Souleymane Keita. It is a white rectangular cloth just a bit longer than 2:3 with a large dark blue half circle shape with its straight side near the mid bottom, a red crescent/banana shape pointing up near the upper hoist with a smaller black such shape on it, and a red "rugby ball shape" set vertically near the upper hoist, with two slightly asymmetrical eight-pointed stars placed vertically on it. Near the latter shape, fly-wise two small purple half circle shapes, both pointing to the upper hoist and the lowest of which, noticeably more crescent-like than the upper, partly covered by a red thing. The large dark blue half circle is in turn charged with two white "lemon" shapes, suggesting eyes though not aligned in parallel, each charged with eight-pointed stars, one dark purple and the other red. A second red asterisk lies nearby on the purple half circle, as well as eylash-like stubby black strokes (two groups, with four and three strokes), as well as a thin white crescent placed vertically suggesting a grin, a black mark near one of the "eye lashes" suggesting a beauty mark, and black bordered red small half circle at the hoist side base of the large dark blue half circle. The UNESCO site used to say about this design that it "unites men who are mobilised by tolerance. It rises like blue music in a blue sky, the image of hope as this 20th century ends", to quote the author's rationale. According to this extinct UNESCO page, Souleymane Keita was born in 1947 in Gorée, Senegal. Like the flag he created, his painting adapts themes from his surroundings such as elements from nature, music, and spiritualism, integrating a variety of styles - abstractionism, figurative, impressionism. Recent photo evidence suggests that flag manufacturers cropped or changed the original design so that the large blue shape reaches the bottom edge of actual flags. This image shows the flag as illustrated in some (of the many) previous versions of the UNESCO website, with the large greenish round thing at the lower viewer's right (hoist?). 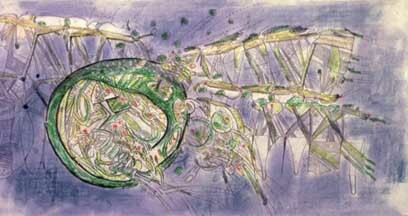 "The Earth is Our Skin" by Roberto Matta can be quickly described, but not because of its simple design. On the contrary, it is quite complex, and the source image was very small. It is a ~1:2 mainly purple and white cloudy background with green (light and dark) and golden things on it, some of them with small red dots. There is a mainly round thing near the hoist and other smaller things scattered about. The UNESCO site used to say about this design that with it the author "raises a cry of alarm" and "makes an appeal": "The earth is threatened." "You must love the earth above all else. It is truth and light. It is our skin". Furthermore he thinks that tolerance is the affirmation of the desire to live, to retrieve nature. 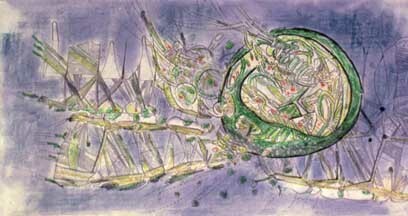 According to this extinct UNESCO page, painter Roberto Matta was born in 1911 in Santiago, Chile. The latest incarnation of the UNESCO site shows the same design but with the said large greenish round thing at the lower viewer's left (fly?). Since the design is rotated (180�), not flipped, this is not a reverse / obverse issue. "The Balance of Life" by Dan You is ~2:3 divided red over light blue by a cubic curve and over all two overlapping horizontal ellipses tangential to the curve: These are yellow in the overlapping "rugby ball" shape, dark blue over the red area and light yellowish green over the light blue area. The UNESCO site used to say about this design that the "flag represents the four elements: Air, fire, earth and water, the source of all being and beyond any dogmas�The defined and infinite forms reflect the paradoxes of the Yin and Yang components of balance. Asia has found and will find the paths of tolerance within its extremes." According to this extinct UNESCO page, Dan You "was born in 1958 in Saigon (Viet Nam)." "The Path of the Infinite", by Rachid Koraichi, an Algerian artist born in 1947 is dark blue, slightly longer than 2:3 divided vertically in two equal parts: The hoist side has a golden pentagram touching the edges, its triangular points and around/outside its edge filled with Arabic writing like a fringe. On the core of the star there's a 4x4 table filled with Arabic numerals (or something). The 7x7 rectangle on the fly half contains golden letter-like elements, some of which seem to be whole Arabic words while other what look like Sumerian cuneiform pictograms. In spite of the Arabic (right to left) writing on this flag, the fly seems to be at the viewer's right hand, as an actual flag photo shows. The manufacture of this flag was almost certainly in some printing technique (i.e. not by stitching together monocolored pieces of cloth) and thus its sides are a mirror image of each other. However this was surely away from the designer's plan? The author says that "blue, a supraterrestrial colour, is the path of the infinite. It expresses detachment from the values of this world," and that "for an African, gold is the principle of solidity, of human security, the principle of happiness. The five-pointed star incarnates the human microcosm" and it "shines in people's hearts, which are obscured by passions", says the author. As for the checkerboard on the fly side, it is "like a talisman" and "recalls the seven words of the Muslim profession of faith: seeking, love, knowledge, independence, unity, wonder, devotion." "Harmony and Evolution" by Friedensreich Hundertwasser. According to the UNESCO site (not available anymore at its original location), this design "expresses mankind, and the colour blue means hope; it is the sign of the development of humanity, an integral part of the universe" says the author, one of the leading figures of contemporary art, born in 1928 in Vienna. And he adds that "we have entered the new age of tolerance, which has become an absolute necessity. This flag is a Treatise that implies the endless cycle of the renewal of life and of peace." Mr. Hundertwasser is not unknown to vexillologists, for he's the 1983 author of the Koru flag nowadays used by veteran alternative lifestylers. Our page is not 100% specific about this having been launched as a new NZ flag proposal. How does this pertain to the 1996 6th UNESCO flag of Tolerance, apart from the author being the same? Well, it is the same design with green changed to blue. Anyway, as James Dignan said it about the NZ design, "The flag is divided diagonally (party per bend sinister), starting at the bottom corner by the flagpole, with very light blue-green over" blue. "However, as it approaches the top on the fly side, the green curls over into a spiral shape." I would add a black vertical stripe at the hoist.